As promised, am here with the reviews of Ilana Organics brand. This is a new natural, organic brand in the market and I have already done a short introduction about them here. Click the link to read about them and their range of products. Many of you had asked for detailed reviews of their products. 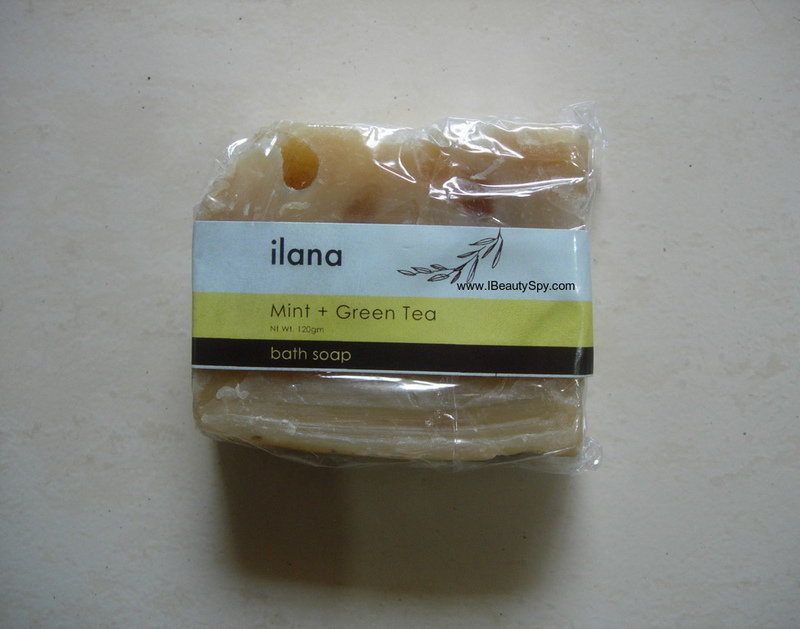 So today am reviewing the first product I received – Ilana Organics Mint & Green Tea Bath Soap. Its a cold-processed soap, so am sure most of you will be interested in it 🙂 . Let’s start straight away. Coconut oil, Olive oil, Rice bran oil, Sunflower Oil, Castor Oil, Sodium Hydroxide (lye*), Green Tea Extract and Spearmint essential oil. Ilana Organics Mint & Green Tea Bath Soap comes wrapped in a simple plastic-cover packaging. I wish they had an eco-friendly paper packaging which many brands are using nowadays. The soap as you can see in the pic is irregularly shaped since its a handmade one. Before starting, I would like to say, I am biased towards refreshing fragrances. Any skincare product with mint or green tea, I would just want to try it immediately. I used to make DIY mint-green tea face pack at home before. Even I love sipping on mint flavored green teas. So the scent of this soap just lured me. It is so rejuvenating, refreshing and calming to the senses. The scent lingers for a couple of hours. I generally don’t use soaps for cleansing my face. But since this is 100% natural and cold-processed, I thought I will try it on my face too. Also I was having some acne issues, so I thought mint and green tea will help to calm down. Ilana Organics Mint & Green Tea Bath Soap lathers quite well. 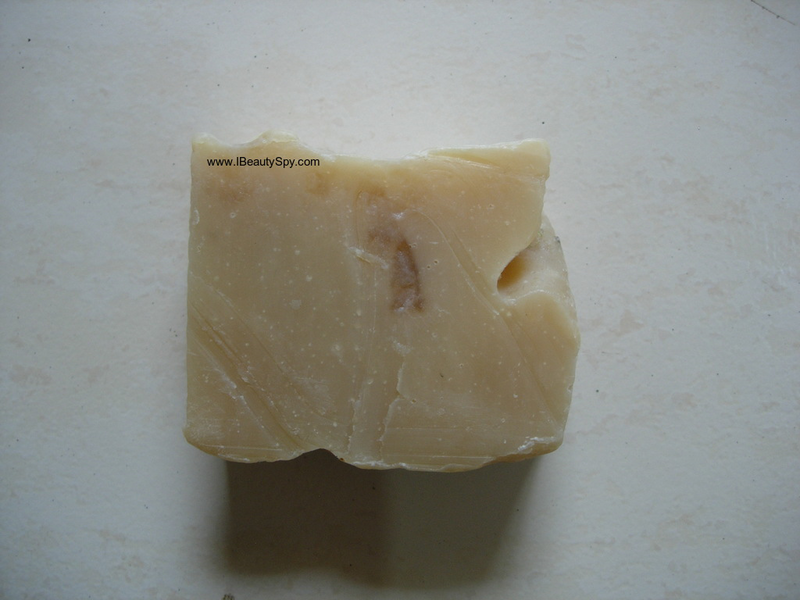 The lather is very soft and doesn’t irritate skin. It deep cleanses the skin and removes all oil and dirt. My skin feels so fresh and clean after using it. At the same time, it doesn’t make my skin dry. But, I still would recommend following up with a moisturizer or body lotion. While using on my face, it unclogs pores and helps in reducing whiteheads formation. I feel it can help in preventing acne to an extent, compared to other soaps. So it is good for oily and acne-prone skin people. But other skin types can also use it as it doesn’t dry out skin. The only con I had with the soap was that it melts easily and loses it shapes soon. So make sure you dry it well after using. * Green Tea – Green Tea is rich in catechins which are anti-microbial and help destroy acne-causing bacteria. The polyphenols in green tea damage bacterial membranes and fight against infection. It also helps to flush out the skin toxins and impurities. It reduces irritation, redness and inflammation. Green Tea is also a potent anti-ageing ingredient which helps to fight off free radicals damage. * Spearmint essential oil – It can relieve skin irritations such as itchiness, insect bites. It also helps to unclog pores and promote its cleansing while leaving skin feeling cool and refreshed. Has anti-fungal properties. * Olive oil – It is rich in vitamins A, D, K and E. Olive oil is also an antioxidant which help protect the skin from premature aging. It restores skin smoothness and nourishes skin. * Deep cleanses skin without drying. * Removes all oil and dirt. * Unclogs pores and reduces whiteheads formation. * Lather is soft and doesn’t irritate skin. * Refreshing and rejuvenating scent of mint and green tea. * Makes skin feel fresh and clean. * Gentle enough to be used for face also. * Wish they changed plastic packaging to eco-friendly paper packaging. Maybe. But I would like to try their other variants of soaps. Yes. Mid-range price. Not too high, not too budget-friendly. Decent price for a natural, cold-processed soap. 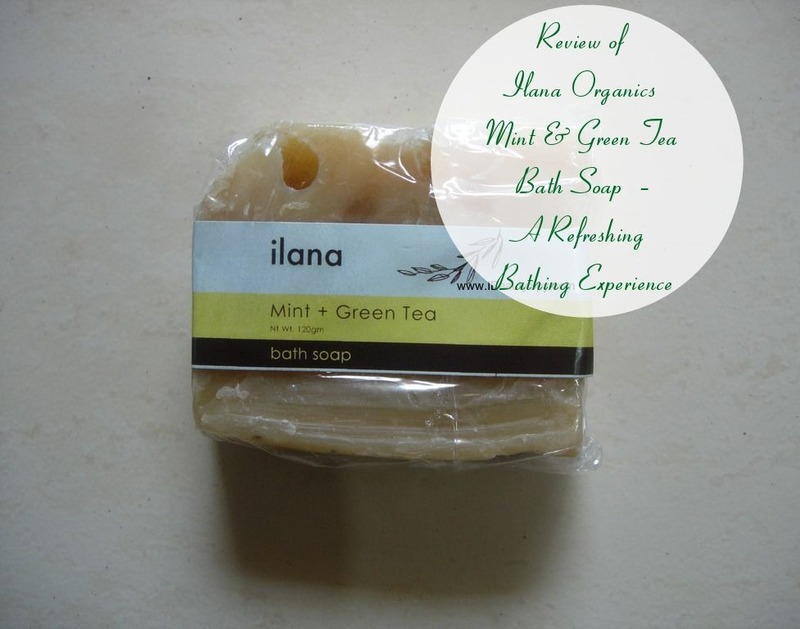 I really loved the refreshing bath experience with Ilana Organics Mint & Green Tea Bath Soap. The scent, the performance everything is really good. And the price is also decent and good value for money. I would recommend this soap definitely. It is suitable for all skin types, especially oily and acne-prone skin will benefit from it. I’m also drawn to products which contain mint or green tea. In my opinion, products which consist of green tea and mint extract along with coconut oil are worth the try. Thank you for this lovely review. Seems a good one , especially since it gives cooling sensation 🙂 But bit pricy . Though I’ve always been a fan of shower gels but now after reading the review, I’m really excited to give this one a try since it’s packed with Vit E and olive oil – My two favourite nourishing ingredients. I’m not sure if this is an issue with handmade soaps but I find that they tend to dissolve very quickly. Apart from this it sounds like a must try soap.